This felt like a reasonable number of books to account for the fact I’m a somewhat slow reader (it’s the writer in me; every book I read is a study in writing craft), as well as the fact that not everything I read is in book form: I read blogs, I read the newspaper, I read fan fiction, I read the ingredients of my cereal box. In French. 1) Choose books that interest you. Uninteresting books take longer to read, and longer time is wasted time. 2) If you start a book and it is uninteresting, ditch it. Some people, I know, feel obligated to finish every book they start, but life’s too short to for that. Literally. Hundreds of thousands of books are published every year; even if you read a book a week and live as long as Methuselah, you won’t even put a dent in that number. Therefore, given the obvious caveats of being required to read something for work or school or research or because someone important to your wrote it, you might as well devote what relatively little reading time you have in this life to books you enjoy. 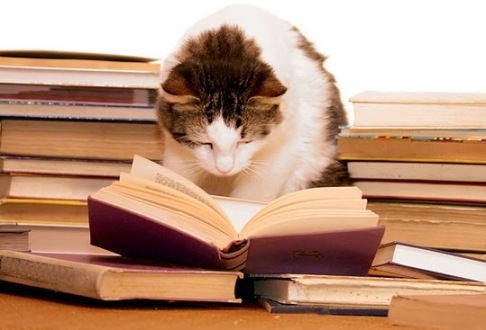 3) Don’t read overly long or complicated books. Not unless you’re prepared to take an overly long time to get through them (which will require adjustments to the rest of this plan), and again, not unless the books truly interest you. 4) Choose your reading time and protect it. Can’t you see I’m trying to read? Here’s your first real hardball in this plan – the first aspect that requires real commitment on your part: You need to find time in your busy day-to-day that you can devote to reading – everyday. Maybe before bed, or during your morning commute on the bus. Since I commute by bike, and since I live alone, I chose to read while eating dinner. Whatever time you choose, it needs to become part of your life for the entire year. You’re building a reading practice here, and like most successful life practices, discipline is required. 5) Read at least 5 pages every weekday and at least 20 pages every weekend. Another absolute that’s more a hardball in disguise. Five pages a day is a wholly manageable and unintimidating amount. So too is 20 pages on the weekend. Two whole days to read 20 pages. And pages only half-filled with text (chapter beginnings and endings) count. “But wait!”, you’re probably saying: these values only equal 190 pages a month [(5 pages x 22 days) + (20 pages x 4 weekends)], which doesn’t equal anywhere close to a book a month. What 190 pages does equal, however, is well past the number of pages any book should take to start getting good. And this is the point where this reading plan starts circling back upon itself, and the magic starts to happen. Because if you did your job properly in step #1, choosing a book that interests you, step #5 becomes very easy indeed. Five pages a day is such a ludicrously small amount of daily reading, depending on how fast one you read and how much time you’ve set aside to do so, you very well might find yourself reading more. And on the weekends, which many people spend trying to catch up on stuff they didn’t do during the week, you might just find yourself relishing the opportunity to get ahead in that great book you’re reading. Especially given that 190 pages also represents either just shy of or just past the halfway mark in most modern books. Reaching the midpoint of a book is its own motivator to keep going, like having crested a mountain where both the view and one’s sense of accomplishment is spectacular, and all the remains is the thrill and ease of skiing, sliding, rolling, or rambling straight down the other side. Bonus #1: Carry your book everywhere. Because every dental waiting room, long queue at the bank, or friend stuck in traffic is an impromptu reading session. Your day-to-day is full of them. Bonus #2: Read those guilty-pleasure books you know you want to read. Gabriel’s Inferno? Snooki’s A Shore Thing? Any of the numerous imitators of The Hunger Games? Go for it! The writing in books like these tends to be fairly simple such that you can blow through them in just a couple days. Which gives you a whole other month to chew through your next 1000-page doorstopper. Now it’s your turn: How many books do you typically read in a year? How do you fit book-reading into your day? Share your tips in the comments. This entry was posted in Adventures in Reading, Lifestyle and tagged Books, Reading, Time management. Bookmark the permalink. 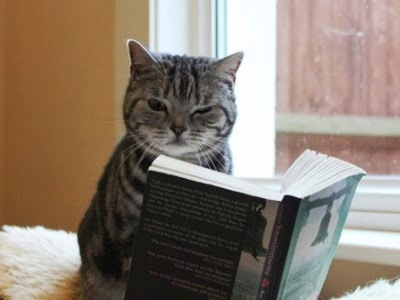 Good tips Janna, but I think I need that reading cat of yours who can read books for me then summarise them for me 🙂 Reading seems such a luxury when there’s so much other, productive, stuff to do, though I realise that reading good writing assists one’s own writing. Love the second one. Why in the world do people insist on torturing themselves with books they hate? No one is keeping score, and you don’t get paid at the end. Reading is for pleasure and knowledge, not to prove you know how to suffer silently. I do tend to read semi-academic books (that is, books analyzing classic films or music genres or whatever, written by a college professor). They can turn into a slog if the writer fancies herself someone with a giant, impressive vocabulary. And I read mostly non-fiction, which probably takes longer than fiction. I’ll probably aim for 8 or 9 book this year. Seriously! No point being a martyr to one’s own boredom. I think a lot of people got the idea that reading = suffering from school, sadly. I do agree that we should all read a few classics for our own edification, but it does seem like some teachers go out of their way to choose the most boring classics of all! Yes, nonfiction may take longer to get through, unless the author is particularly adept at conveying the information as a story. Whether fiction or nonfiction, there should always be an underlying narrative. Dianne, you are a stern reader indeed! I’ve been known to give books up to twice as long, for all that I can’t recall having ever been rewarded for it. And 10 minutes for movies? Wow. I don’t think I’ve ever actually bailed on a movie. And I actually dislike most movies. I think I stick with them regardless because they’re good study tools for what not to do in storytelling, and are so much shorter than reading bad book. What an impressive site, Janna. I’m glad I discovered you through someone else’s website, and hey, that’s how it happens sometimes, right? These kitty photos are so cuuuuuuuute. Anyway, to our topic. Managing Time (note the capital ‘T’). I discuss the issue at small length in my post, “Mulling over Time”. I invite you to pop by and see it, and perhaps leave a comment so we can chat. Yep, it seems finding time to read is as difficult as finding time to write. You’ve read Pillars of the Earth! I still haven’t worked up the courage to turn those 1000 pages. Happy reading, Janna, oh, and happy writing (I see you are busy on a novel). Hi Alex, thanks for the comment. It did help that Pillars was an engaging story; I never would have survived 1000 pages were it not. I will check out your post. My time is the most valuable non-renewable resource I possess, so I try to manage it the best I can, but new tips are always appreciated. Happy reading (and writing) to you too. Number 3 is so true for me. I’ve started a few classic novellas recently and am having a great time. Brevity itself is a quality I’m finding myself being drawn to. I also find that taking transit really helps with reading. I don’t have the internet to distract me and I can really sink into a good groove.